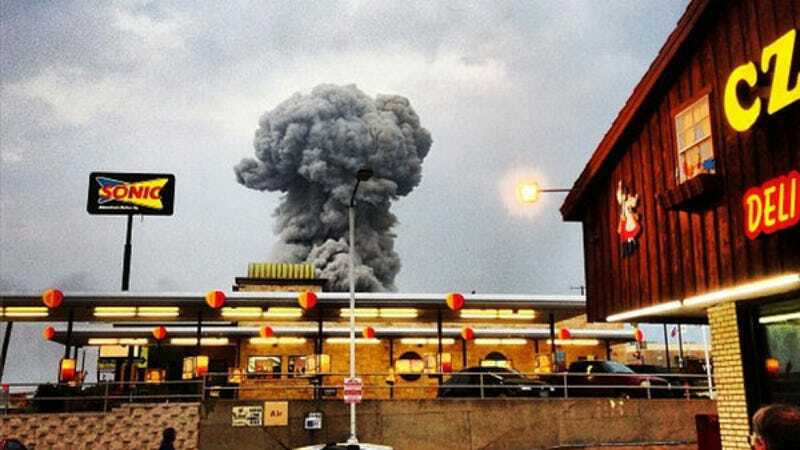 As soon as I heard there was an explosion in West, Texas at a fertilizer plant my thoughts were with the people there, but like many Texans what I know best about West is the world famous Czech Stop gas station and bakery. Then I saw this photo and I stopped breathing for a moment. It's clear now the number of casualties and the damage to this small town of around 3,000 far exceeds the concern over a small gas station in North Central Texas, yet given the number of towns that size most Texans have never been to or couldn't name, there's a special reason why so many of us knew precisely where West was when we heard the news. When I first tweeted last night that there was a nightmare situation in West, Texas, two of the responses I got back were Czech Stop-related. West is located along I-35 between Austin and Dallas, which means it's the access point to North Texas and the Metroplex for much of the state. The history of the town goes back to the 19th century (the town's one state historical marker, coincidentally, relates to a deadly explosion of a different kind), so I don't mean to trivialize the many places and people who give it value, but this is what puts it on the map for many of us. Many towns in this part of Texas were founded by either German or Czech settlers, who brought with them their own language, culture, and cuisine. While many of those native dishes adapted to the ingredients and indigenous cultures of Texas, certain dishes maintained most of their traditional form. Most notably, the Czech pastry "kolache" (pronounced koh-law-chee) is still served today in restaurants and rest stops from Columbus near Houston all the way up to West. It's a soft, sweet dough filled with some fruit, cheese, chocolate or some mixture of all of those. It's fantastic. Your favorite kolache probably has a lot to do with which roads you take to get around, but everyone knows the Czech Stop and it's no surprise then that, when I turned on the local news last night, the news producers had thought to call the Czech Stop and put an employee on the air. It's what everyone knows. 1. Yes, the Czech Stop is ok.
2. There are many people outside the Czech Stop who are not. Because of the weather, the extent of the damage, and the toxic chemicals still around it's possible we won't know just how many people were killed for a couple of days. Photo Credit: Emry, Kent Wang, Andy Bartee.